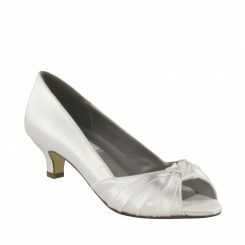 Angela Nuran Marlene silk is one of the newest additions to the Angela Nuran Signature Collection and is definitely the best mixture of ultra comfortable bridal shoes and elegant style. 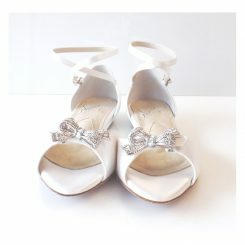 Marlene is available in size 5 1/2 – 10 medium. Although, these shoes are well equipped with an adjustable front strap across the front that can be set to three different widths: medium, wide or narrow. 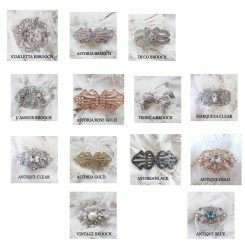 Angela Nuran clips are interchangeable with any other Angela Nuran clip that we offer. If you would like your shoe to ship with a different Angela Nuran clip just call or mention the clip change in the order notes. If you would like your shoes dyed by us but you want to try them on first, select “None/Not Dyed” for the color. We will include instructions for sending your shoes back for dyeing (or returning/exchanging). All shipping costs will be at your expense. *In a rush? 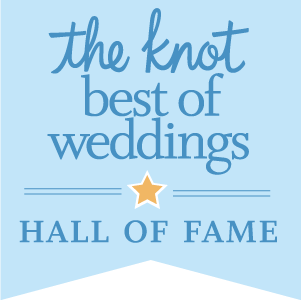 Give us a call and we may be able to rush your order for an additional charge! All shoes are dyed to match INDOOR LIGHTING! if your event is OUTDOORS please call and place your order over the phone to go over the details (888) 393-2253. Angela Nuran Marlene silk is one of the newest additions to the Angela Nuran Signature Collection. 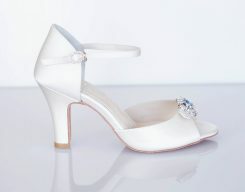 The Marlene is definitely the best mixture of ultra comfortable bridal shoes and elegant style. These shoes are well equipped with an adjustable front strap across the front that can be set to three different widths: medium, wide or narrow. 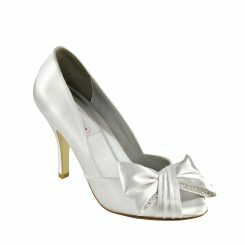 The adjustable side ankle buckle is beautifully decorated with Swarovski crystals to give it that extra sparkle. This buckle can be placed anywhere along the strap because there are no holes in the strap; it’s an easy fit! 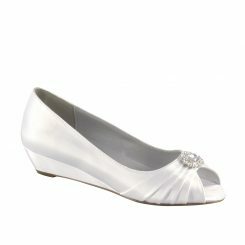 The Marlene has a very sturdy heel making it the perfect shoe for those outdoor ceremonies that may be on grass or cobble stones. 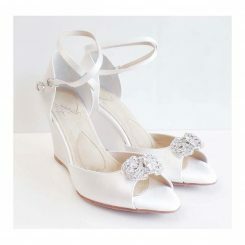 The Angela Nuran Marlene also offers more arch support since the wedge runs under the entire length of the foot. 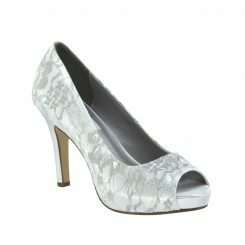 Like all Angela Nuran shoes, the Marlene comes with a flexible suede bottom and a generous amount of pillow top padding. 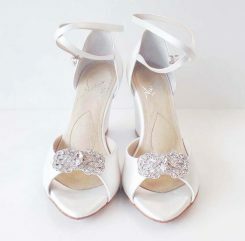 Brides can wear these shoes and be comfortable all day and night. 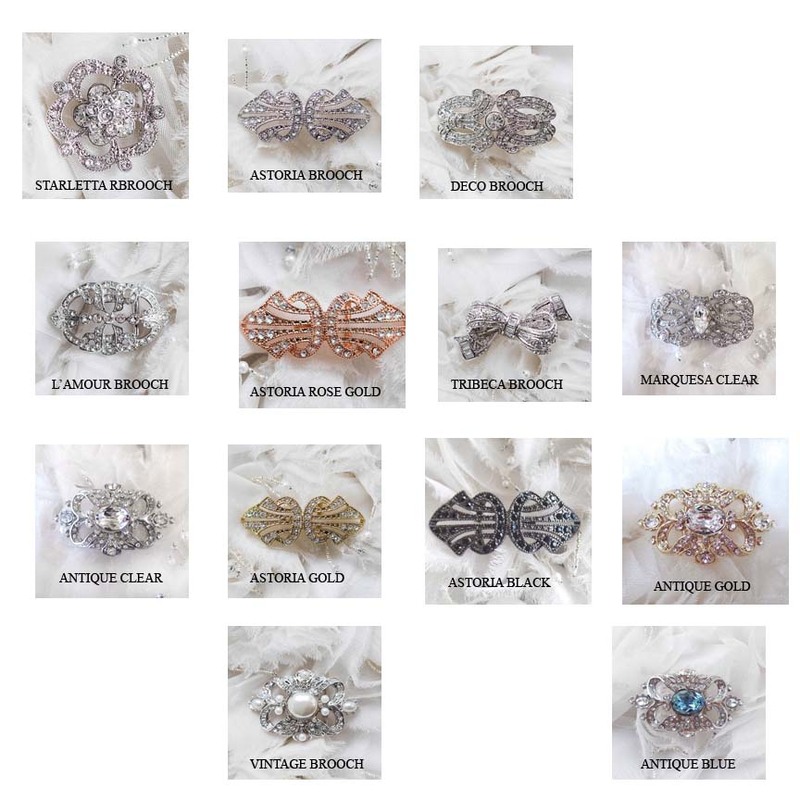 The Marlene comes with the Marlene brooch which is interchangeable with any of Angela Nuran’s brooches. This shoe can be custom dyed to match any color. 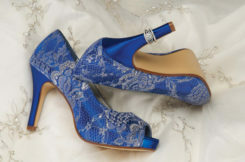 They can also be re-dyed to a darker color after your event, so you can continue to wear these incredibly comfortable, gorgeous shoes!